The sun shines on the righteous? We were lucky over the weekend that the sun shone on Saturday for the hunt breakfast, which came to Rockley for the first time (the breakfast, not the sun - though some of the rehab horses are amazed at the change in the weather, never having seen the sun up here to date...). We and the team were too busy serving sausages, bacon, eggs, mushrooms, tomatoes and toast to get out on horseback, but fortunately Richard took Felix, who would have sulked for weeks if hounds had been here and he hadn't been joining them(!). Although there were some heavy showers on Sunday, yesterday the long-awaited high pressure finally arrived, and everyone on Exmoor who still had hay to cut - us included - duly went into a frenzy of mowing and turning which will last the rest of the week. The forecast is for more blue skies, crisp nights and warm days - I hope they are right! 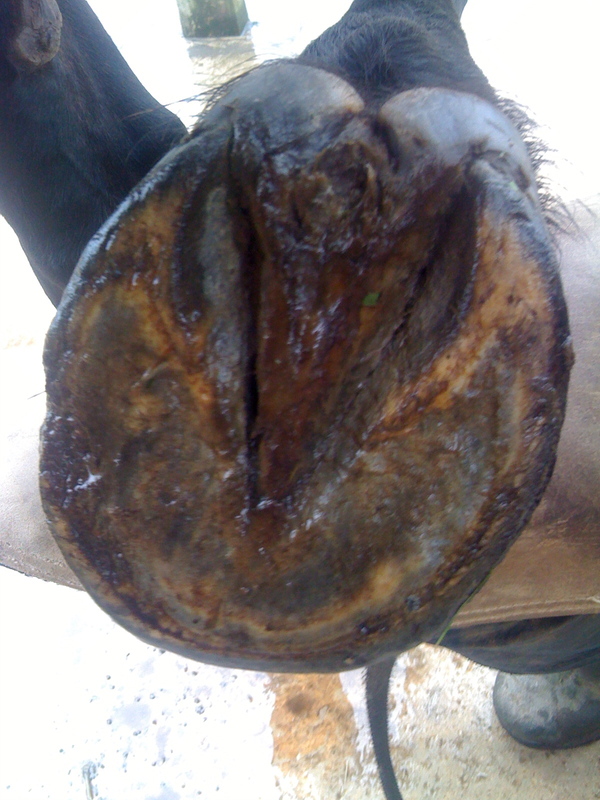 She has nice-looking feet, and her main issue (in common with nearly every horse who comes to us) was that her caudal hoof problems had stopped her landing correctly - as you can see from the clip - and this over time had made her lame. I will post some photos of her hooves this week as well but for now she is improving her landing slowly but surely, and I hope will soon land as nicely in front as she does behind! You'd be forgiven for thinking that its already October on Exmoor...At the moment we are suffering from temperatures more reminiscent of autumn than August, monsoon levels of rain, force 10 winds and - on the days when its not blowing a gale - pea-soup fog. 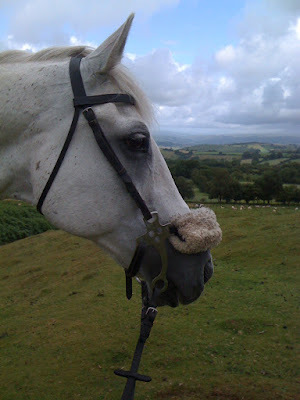 The horses are mostly in medium-weight rugs, I'm wearing 2 thick fleeces and the woodburner is going in the evening. The dogs are refusing to go outside, the cattle are hiding under the hedges and the sheep have occupied an old field shelter and aren't even poking their noses out, despite there being masses of grass (about the only giveaway that its actually still "summer"). Its par for the course to have a few grim days up here, but we've had more than our full 40 days of rain and unsettled weather since St Swithin's day. For the last 3 years, its rained on July 15th and we've had the same until the end of August - there's a good reason behind most of this folklore(!). Meanwhile, here are Storm's hooves - he had been barefoot for quite some time before he came to us, but although his hooves were healthy in many respects he had a weak caudal hoof and moved with a pronounced toe first landing - he had been diagnosed with a severe DDFT lesion on MRI. I put lots of footage of rehab horses up on this blog, but it occurred to me last week that I've never put up equivalent footage of healthy, hard-working hooves. I went to see Lexus on Friday and his hooves were looking so fantastic that photos were obligatory! He was here for rehab for 3 months and has spent the last 2 months working 4 times a week, hacking out on lanes, fields and bridleways. These photos show the improvement over exactly 5 months - his shoes came off on 19th March and these were taken on 20th August! Its particularly impressive when you realise that Lexus is 19 yrs old and had been shod for most of his life. I had a fun conversation a few days ago when we had been out hunting. There were visitors out from another part of the country and they had been following on foot all morning. They had their own horses at home and were intrigued to see horses out without shoes and came up to ask me about it as we loaded up at the end of the day. They noticed not only that our horses had gone all day without shoes and remained sound(!!!!!!! 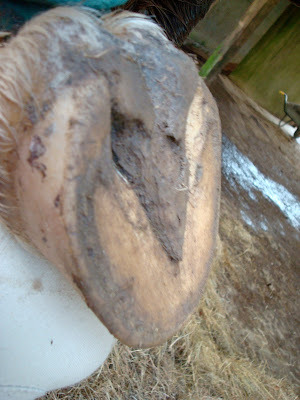 ), but that between them the horses (Charlie and Felix) had 7 white feet. Our friend Sam is a seriously good photographer, and she is on a mission this summer! She took this stunning photo of Charlie a few weeks ago, and followed that up with a photo session with Bailey this weekend. My parents came to stay at the weekend and my Dad brought down a shelf-full of novels by John Buchan (he wrote The Thirty-Nine Steps, amongst a host of others). They used to live in the spare room in our old house, and I hadn't seen them for ages. "... Tallis was a master of foxhounds, a mountainy pack, with some of the old shaggy Welsh strain in them, which hunted about a hundred square miles of wild country. The river valley was pockety and swampy but the short bent of the moors made splendid going...it was soft grey weather in which scent lay well and he had several glorious days up on the roof of things. "You never saw such a place", he wrote to me. 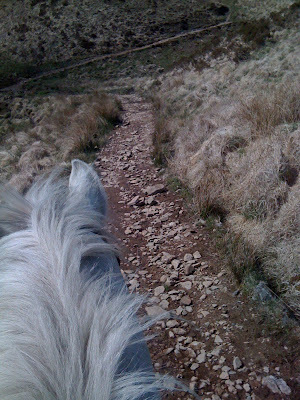 "Nothing much to lep but you must ride cunning, as on Exmoor, if you want to keep up with hounds. I couldn't keep my eye on them for the scenery. " I had a very interesting day on Saturday with Mark Caldwell, who is a very well known farrier and senior tutor at Myerscough College. Mark has consistently pushed for more research into hoofcare and shoeing, has worked with many leading vets and farriers and is the driving force behind a number of ongoing research projects into hoof form and function. I've uploaded new footage of Bailey W, following the photos last week, which is very interesting. When he arrived he had a classic toe-first landing in front but also had a compromised right hind - if you watch the footage you can see the RH sliding rather than landing. Bailey is a quick learner (!) and started to land heel first in front after a couple of weeks. At this point he had a shortened stride on concrete because his sole was flat and he his hooves were very under-run. Despite a better landing in front, he was still struggling with his right hind. The last clip was taken yesterday, 5 weeks after his arrival, and although he is not yet capable of working on tough surfaces his stride length on concrete has improved. Importantly, his movement behind is also more correct and he can now land, rather than slide, on his right hind. It was a very sad day yesterday, as we had to make the difficult decision to have Ghost put down. He has had a marvellous summer and has been on great form so the consolation is that we have yet more wonderful memories to add to the 15 or more years worth since we first met him. He has had melanomas for a long time, like most old grey horses, but up until a few weeks ago they had never caused him any problems and he had always moved and behaved more like a 4 year old than a 25 year old. We had a suspicion recently - confirmed by the vet - that he might also have internal melanomas and so this wasn't entirely unexpected. Fortunately, we caught it before he became distressed and I don't think he was ever more than slightly uncomfortable - right up till Wednesday night, he was able to zoom across the field at an extended trot when a new horse arrived. I owe Ghost an enormous debt, for lots of reasons, and not least because its due to him, and the fact that he was diagnosed with navicular syndrome all those years ago, that he and all our other horses are barefoot. He was our first rehab horse, though I didn't realise it at the time. 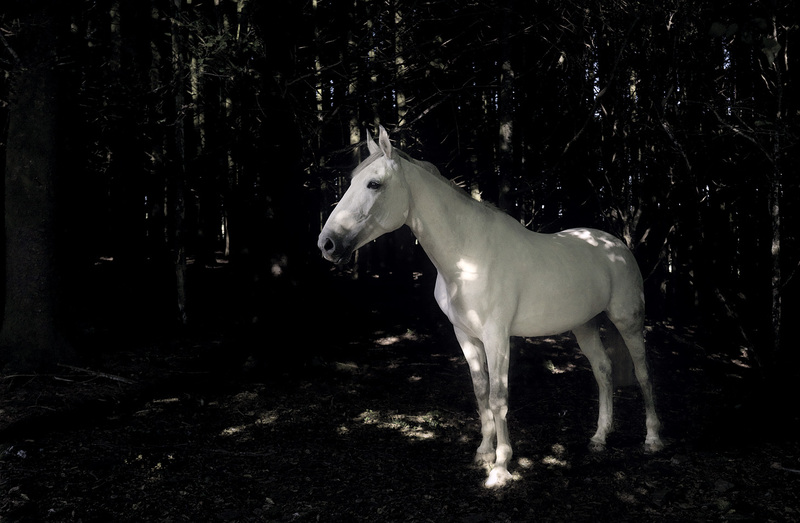 Ghost has always been a handful to ride, happiest at speed and intolerant of any horses in front of him, but he has also always been a perfect gentleman. He has been endlessly patient with generations of puppies running between his legs and was always extremely careful not to tread on them. He has been found on several occasions in his box being groomed by children who'd escaped supervision - one memorable time a small boy dragged a box over and stood on it so as to reach Ghost more easily, and Ghost of course remained motionless till he'd finished. He was even invited to our friends, Anita and Yorkie's wedding as guest of honour a few years ago. A quick set of comparison photos for Rose, who has been here 10 days, and Bailey, who arrived at the beginning of July. Surely horses have a sense of humour...? I have no difficulty in believing that animals experience fear and having lived with horses, dogs, cats, cattle and sheep, I would credit them with a far more extensive list of emotions. I don't think its anthropomorphic to ascribe excitement, anger, peacefulness, joy, frustration or contentment to our animals - we experience these emotions and demonstrate them (sometimes irrationally!) through our behaviour and I think most people who look after animals recognise the same emotions demonstrated through their animals' behaviour. Charlie, for instance, is almost bursting with anticipation when he goes hunting at the moment - he is the physical embodiment of the feeling you get as a small child on Christmas Eve - he can't possibly stand still, he can't possibly go to sleep, its just too exciting! In another parallel, I remember my father (a retired consultant psychiatrist and life-long non-dog-owner) noticing that my dog, Rufus, was very subdued after our other dog had died suddenly and remarking that there was no physiological reason why dogs, just like people, shouldn't experience grief and depression. The internet is a marvellous way of sharing information, and I am convinced that the wealth of stories, articles and tips online has been a huge factor in making more people interested in barefoot horses. There is one obvious snag, which is that you don't have any way of being sure, online, whether the person whose story you are reading or whose advice you are taking is really all they seem. I had a good example recently, when an owner asked if I had heard of a particular trimmer whom they'd been recommended. This person has a lovely website and comments extensively on internet forums. She writes extremely well, and to read her posts and articles you would assume that she had lots of experience and regularly worked and competed her horses. Unfortunately, the reality is that she has lots of enthusiasm, a little experience and no training. She does not carry insurance and probably has no commitment to continuing professional development. Nothing wrong with that per se, but possibly not someone you would be wanting to pay to trim your horse. Equally I know of another trimmer who is outstanding but has a very modest website from which you would have no idea of how good she really is(!). Obviously if you meet someone in person, you are more likely to get a "gut feeling" about whether they are what they appear to be, but there is no getting away from the fact that trimming is a completely unregulated industry. Its not the end of the world - I used to work in an incredibly heavily regulated industry and you still got good practitioners, bad practitioners and indifferent practitioners - but it does mean that the onus is on the owner to work out whether someone is worth paying or not. do they understand that barefoot is more than just taking shoes off? 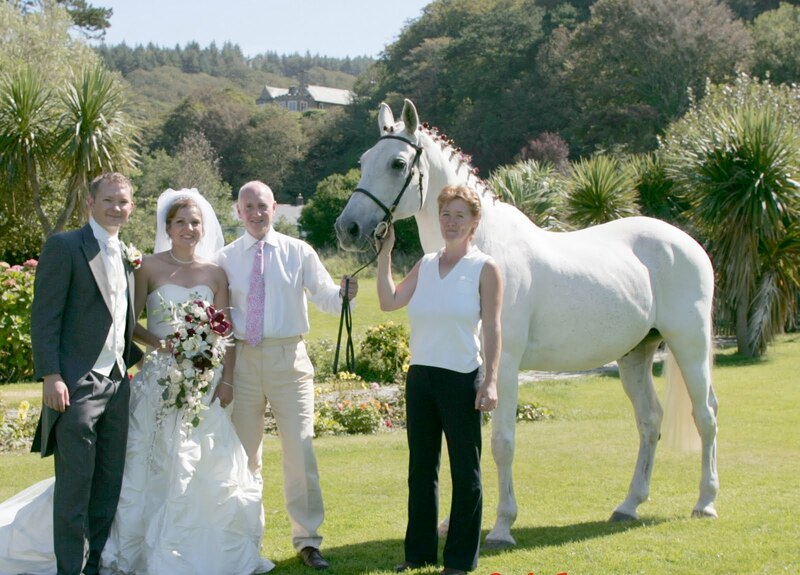 can they effectively advise on the horse's diet, environment and exercise? do they routinely assess the horse's movement, before and after it is trimmed? do they have horses on their books who are working HARD without shoes and preferably competing? can they provide references to back this up? do they own their own horses, and do more with them than a quick hack round the block? do they undertake continuing professional development? There are lots of theories out there about why horses were first shod but its a question that comes up time and time again. 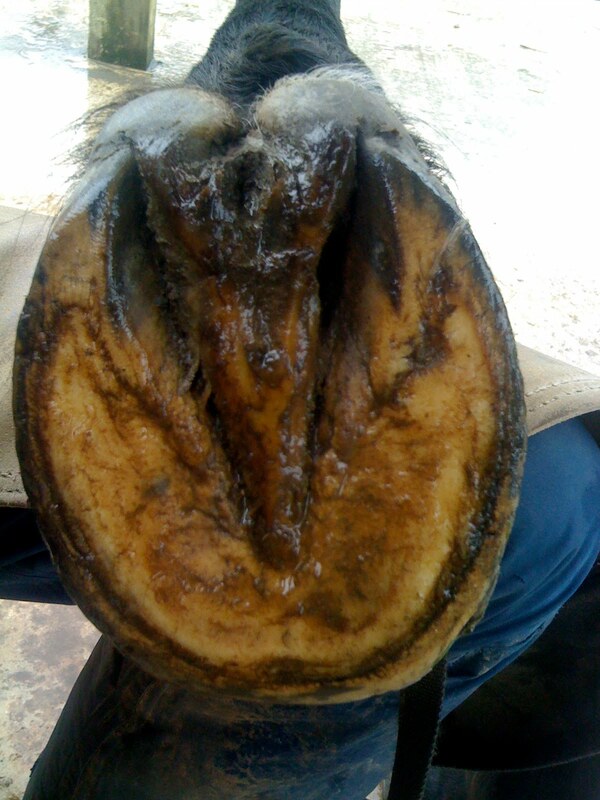 If a bare hoof can perform so well, why WERE horses first shod? I suspect if the world were full of horses like Felix, horses never would have been shod because he has always had fantastically healthy hooves which out-perform shod hooves and need almost no help at all to achieve an amazing level of performance over all terrain. The reality is, though, that many horses don't have the perfect diet, environment or exercise for optimal hoof growth so they don't have perfectly healthy hooves. 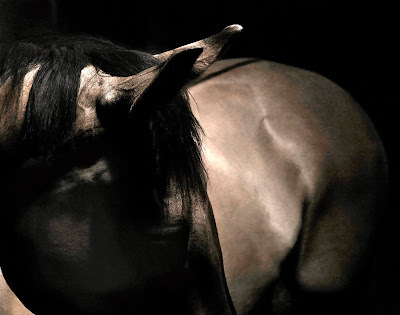 The short answer, which has the virtue of being true, is that if you have a horse with less than healthy hooves, the quickest way to achieve a higher level of performance - more miles, tougher terrain - than those hooves would naturally be capable of is to put shoes on. "Its easy for barefoot horses on the moor"
There are some people who think that Exmoor really is all moorland, and envisage our horses only ever going on lovely soft turf, or perhaps bog (the latter is more common than the former, naturally!). They of course are convinced that this perfect, easy ground is the reason our horses can hunt barefoot season after season, and then they solemnly state that (of course!) their horses can't go barefoot because (horror of horrors!) they often have to ride on roads or even (can you imagine?! ), stony tracks. Just for the record, here are a few photos of the sort of tracks which are unavoidable on the moor, and which we VERY often go along out hunting. In fact, our terrain is the reason why the organisers of the Golden Horseshoe (a 100 mile endurance ride which takes place annually on Exmoor) were sceptical of the ability of barefoot endurance horses to go the distance. Every year more and more barefoot horses successfully compete, but there haven't been any 100 milers yet...Any challengers out there?! Our latest rehab horse arrived on Monday - Rose - a lovely big mare who has come all the way from Yorkshire. She is another Dutch warmblood, and has a background of dressage and showjumping. As is usually the case, she was landing toe first on arrival - here is her video from Monday. For interest, here are some 3 week comparison photos of Bailey W. He arrived with a good digital cushion and adequate frogs, but he still had a severe toe first landing. That has now improved, as you can see here: http://rockleyfarm.blogspot.com/2010/07/wonderful-friday-clip.html but he has a long way to go. We will film him again later this week. Yes, the 2010-2011 season has officially begun! Our horses aren't the only ones getting ready for a brand new season. Andy, my nephew SB and I went down to kennels last week and had a lovely couple of hours with the girls, who are primed and ready to go! We didn't trust Andy's quad handling at first, but we reckoned he was pretty good by the end!